The end of the summer not only brings some well received cooler weather to Kaohsiung, but also some of the most impressive skies. Continuing my series on trades here’s an electrical repairman who has been in the business for 30 years. I bumped into this shop while cycling around some back streets. I was actually on my way to somewhere else, but as is the usually case, the best things are found when you are on your way to do something else. This sight is quiet common in Kaohsiung – A trades-person busy at work amongst masses of boxes and tools. I always like to stop and have a look. I asked about what he was repairing and he said “motors”. Judging by the fan blades hanging about the place it must be fan motors. He said had switched to motors after repairing stereo systems for years. Presumably because no one uses stereos any more. I thanks him for the photos, introduced myself, and then carried on my way. At first I didn’t know what he was working on. 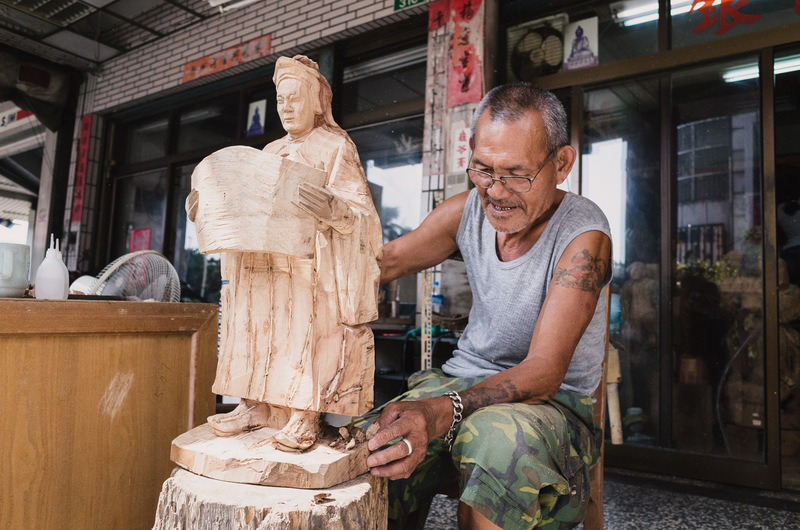 He was chipping away at the base of something, banging a piece of wood against the chisel. The makeshift wooden mallet worn down from probably thousands of hits. With each strike against the chisel he would bare his metal teeth. An interesting character, no doubt, made even better by the Huey and Dewey tattoo on his arm. Eventually he turned over what he was working on and I realised it was a statue. Close to where I live in Taiwan there’s a wet market surrounded by small shops, all enclosed under a roof and hidden in the middle of a city block – You’ll know the type, if you’ve ever been to Taiwan. A couple of weeks ago while I was passing through I noticed this clothing repair and alterations shop. There was a window opening into the alley so I stopped on my bike and took a few pictures through the window. I wanted to catch the woman working at her sewing machine, but while I was taking the photos she turned around and gave me a big smile. I made some small talk which allowed me to take the photo and she told me that she’d been in the business for 60 years. I joked that with that much experience the next time I need some clothes altering or repairing I’ll definitely bring them to her. He was just finishing up a job and packing some things away into his bag when I cycled past. His table cluttered with the tools he’d probably been using all day. I said “hello” and took a few photos before switching angles to try and get all of the table in. In the photo he stopped for a second while packing his bag, possibly wondering if he’d remembered to grab everything he needed. I think I’ll make this into a new series – people and their tools. 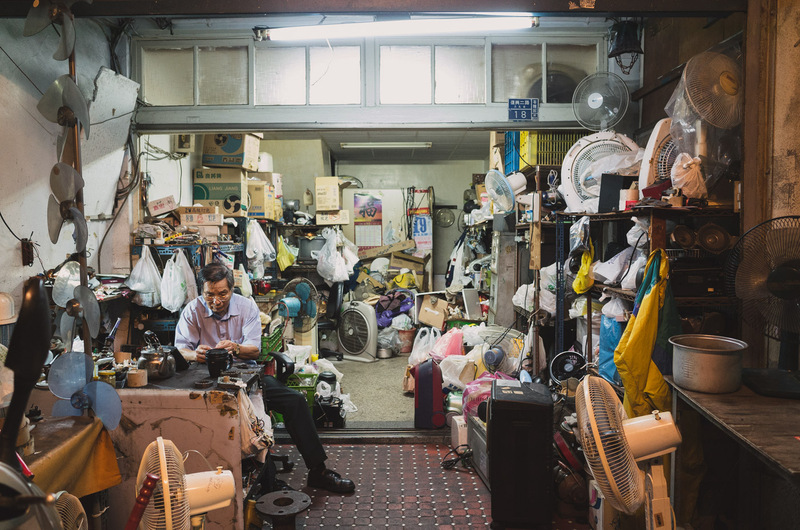 There are so many cobblers, seamstresses, watch repair shops, and any other trade you can think of scattered throughout the city. 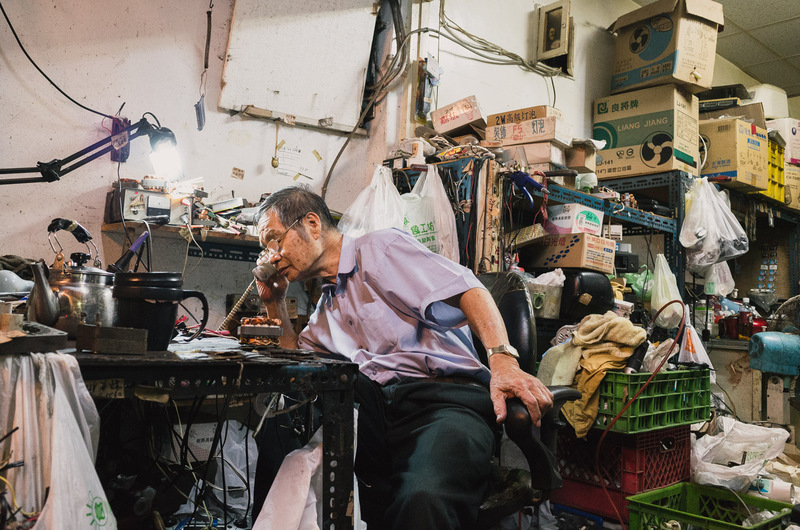 The watch repair shop at Neiwei Flea Market in Kaohsiung. He was so focused on what he was doing, never looking up from the job at hand, that I don’t think he even noticed I was there. There are small lanes and alleys all over Kaohsiung. They run like veins between the main streets, and often you won’t even notice they are there. Traditional indoor markets are hidden from view, embedded in the middle of city blocks. I love places with lots of character. So when I cycled past this claw game arcade the other night I had to stop and take some photos.